There are a few things concerning this latest incarnation of the Frankenstein story that have me interested despite my better judgement telling me it doesn't have much chance of being good. The first two factors are that of leads James McAvoy and Daniel Radcliffe. Despite the fact actors have little influence over the final product, both of these guys tend to choose projects they're legitimately drawn to rather than simply for the sake of having a possible hit to their name. It doesn't hurt that screenwriter Max Landis (Chronicle) is behind the script for this one either. There is of course the look of the film that paints it as another ugly cousin to the likes of I, Frankenstein or Dracula Untold, but I can only hope that director Paul McGuigan (Sherlock) is only employing this aesthetic for the sake of the time period while utilizing the rather above-par factors that are his actors to convey something new and fresh. As Hollywood is virtually unable to leave properties alone these days the least we can hope for is some kind of twist or interesting take on the material and that seems to be the basis for this production. 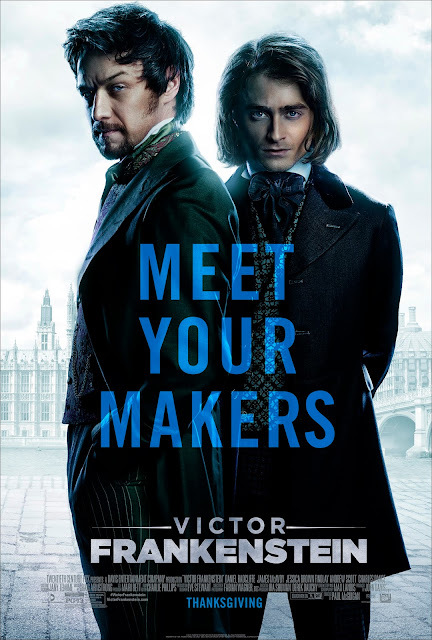 The trailer focuses in on the relationship between Dr. Frankenstein (McAvoy) and his faithful assistant Igor (Radcliffe) which could turn out to be fun as it's clear the two actors have a nice rapport in the introduction for the International trailer. If nothing else, the film will at least clarify to a few generations that Frankenstein is the the name of the scientist who brought the monster to life rather than the monster himself. Victor Frankenstein opens on November 25th and also stars Jessica Brown Findlay, Andrew Scott, and Freddie Fox. Synopsis: James McAvoy and Daniel Radcliffe star in a dynamic and thrilling twist on a legendary tale. Radical scientist Victor Frankenstein (McAvoy) and his equally brilliant protégé Igor Strausman (Radcliffe) share a noble vision of aiding humanity through their groundbreaking research into immortality. But Victor’s experiments go too far, and his obsession has horrifying consequences. Only Igor can bring his friend back from the brink of madness and save him from his monstrous creation.